The French sure do love their liquefied duck meats—you know, the good stuff like mashed up blood, bone, and organs—canard à la rouennaise is literally covered in it. This tool, the Presse à Canard, squeezes out every last ounce of aviary goodness. First, a duck is chosen based on age, plumpness, and origin—apparently young ones from the Rouen region are considered the best for the recipe—and then strangled. (What? How else are you going to keep all the blood in?) It's then defeathered and roasted medium rare before it's skinned, the liver is extracted and ground, and the legs and magrets are removed—magrets being the breast meat of force-fed ducks raised for foie gras. Everything else—the rest of the meat, bones, organs, skin, and whathaveyou—are inserted into a specially designed Presse à Canard. The "duck press" you see above. It works like a wine press, with a vertical plunger crushing/squeezing the carcass until all the juices (blood and other liquids) pour from the front spigot. Consommé, a richly flavored stock, is then flushed through the press—don't want to miss any organ juice! These juices are then mixed with the duck's liver, butter, salt and pepper, and cognac to add flavor, then thickened and finally strained through a fine chinois (look, you want this bloody and thick; not bloody, thick and chunky). The breast is then served with the sauce while the thigh meat reserved as a sauceless second course. Tour d'Argent, the oldest restaurant in France, has two duck presses. 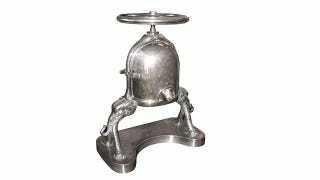 Both are sterling silver and are proudly displayed and used in a raised section of the dining area. Dinner and a show!